The Indian Premier League 2018 is just a few days away, and the country’s leading online streaming portal Hotstar silently introduced a new sports-only yearly subscription pack of Rs 299 for all the cricket enthusiasts out there. The new Sports-only subscription plan is already live for users to purchase for Rs 299, which is about Rs 25 per month. Under this plan, Hotstar will be offering all the live IPL matches along with all the Star India’s sports content such as football, cricket, and other sports. Earlier, Hotstar offered a premium subscription plan of Rs 199 which included premium access to movies, sports and TV shows. 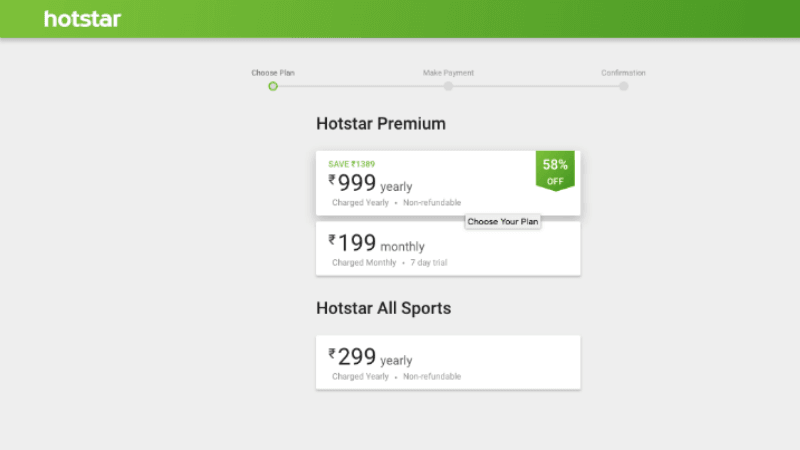 Hotstar is also offering a yearly premium subscription plan, which is now down to Rs 999 only with 58% discount. For the unaware, this is the first time Hotstar has come up with a sports-only offer and that too ahead of the Indian Premier League 2018 set to start later this week. With this sports pack, users get access to live streaming of the IPL matches without delay, while non-subscription users will have to watch delayed live stream (possibly five minutes). And the price of this sports-only pack is attractive too. Most users will not be worried to shell out Rs 299 for a yearly premium plan, and that also includes other Cricket national matches live streaming of Indian Cricket Team. We have a series of Cricket tournaments lined up. Right after the Indian Premier League, India is set to play the Asia Cup 2018 in June, followed by the tour to England. And this pack also gives access to Indian Super League, Wimbledon in Tennis and several other popular sports tournaments. Sadly, Hotstar will not be streaming the upcoming 2018 FIFA World Cup because the rights of which are acquired by Sony India and the live stream can be watched on Sony LIV. But for Cricket and Tennis fans, the sports-only subscription from Hotstar will be a boon. And the content player also decreased the premium Hotstar subscription plan to Rs 999, which is down from the earlier price of Rs 1,200. That said, users will get the enjoy the sports content only in HD resolution because Hotstar is still working on to improve on the quality front. Over the last couple of years, Hotstar has drastically improved the content quality of movies and TV Shows on the platforms, but it still lags behind when it comes to sports, which could be a derail the experience. Hotstar recently launched a dedicated app for Xiaomi Mi TV 4 users in India. Hotstar buffers a lot no matter what speed your internet plan is. They need to invest in more servers and infrastructure. It’s good, but no Champions League for Hotstar, and I doubt we’ll be able to watch the fifa world cup, so it’s only good for watching cricket. Are you using hotstar…does it buffers too much as mentioned in the comments below? I used it about 2 years ago and when choosing the highest bitrate, I had no problems streaming as it took 1 to 2Mbps. I’ll see how bad it is on the 7th. Will be watching mi. Vs csk.